It’s now less than 48 hours until Scotland 7s open their 2011/12 HSBC Sevens World Series campaign on the Australian Gold Coast. The 12-man squad first face England, at 1.19pm local time (3.19am UK time) before taking on Wales (6.47am) and Tonga (9.14am), in Pool D, during day one (Friday 25 November). Head coach Graham Shiel wants to see the new season off to a flying start with qualification to the Cup competition, held on day two. He said: “Preparations have been very positive for us this season with the new strategy towards Sevens in Scottish Rugby. We’ve had regular access to our squad which has allowed us to spend more time together in advance of travelling. 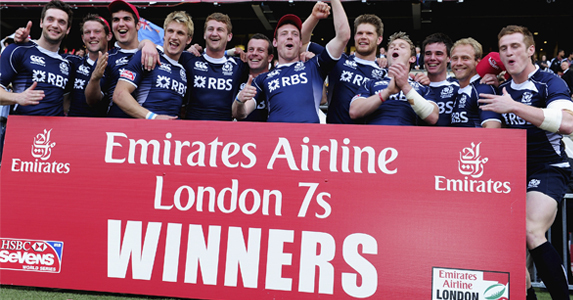 We are well aware of the challenges the HSBC Sevens World Series presents. As part of our preparation we have decided to travel early to Australia to try and overcome the challenges presented to us by the long journey, time change and significant change in temperature. Log onto www.scottishrugby.org on Friday morning for the latest updates on how the team are getting on!